BSNL Tablet Penta T-Pad IS709C is one of the cheapest Tablet in the market manufacture by Pantel for BSNL. 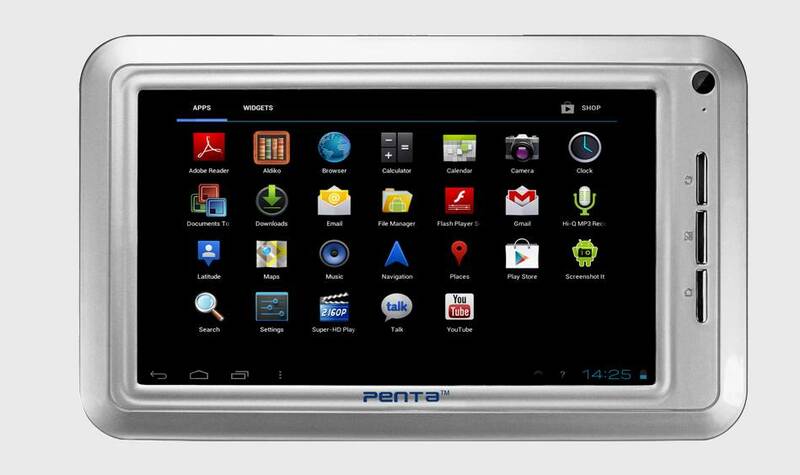 BSNL Tablet Penta T-Pad IS709C has Android 4.0.3 version operating system and Cortex A8 1GHz processor. Primary memory of BSNL Tablet Penta T-Pad IS709C is 512 RAM. The storage capacity of BSNL Tablet Penta T-Pad IS709C 4GB can be upgraded up to 32 GB via Micro SD card. There is only one camera in the device which is front camera of 0.3 MP. The device support Wi-Fi, 2G and 3G Dongle for internet connectivity. BSNL Tablet Penta T-Pad IS709C have USB port and Micro SD Card Slot. BSNL Tablet Penta T-Pad IS709C had 7 inch LCD display and resolution of display is 800 X 480 pixels, Display Aspect ratio is 16: 9. Business Features are Email, E-book Reader, PDF, Word, Excel, Power Point Reader, TXT, EPUB, document viewer and document editor.